With Pastor Christian Schweter (41) taking up office at First Evangelical Lutheran church, a new chapter in the over 155 year long history of this inner-city congregation opens. Pastor Schweter’s arrival marks the end of the longest vacancy in the history of this church that to this day celebrates one English and one German language service every Sunday. The difficult search for a successor for Pastor Wolf-Rüdiger Belzing who died prematurely on New Year’s Day 2004 after 18 years at First ended up in Germany where the EKD (Evangelical Church in Germany) helped screen potential candidates for the bilingual congregation. Pastor Schweter was chosen among 11 applicants and accepted the call. For the past 9 years, he had been Pastor in Northern Hesse in the vicinity of Kassel where he specialized in working with families. Pastor Schweter and his wife have 4 children between 13 and 18 years of age. In his private life, Pastor Schweter is also a track and field master and enjoys mountain hiking. He will be officially installed as First Lutheran’s new pastor on Sunday, October 30th, at 3 p.m. at the church. This service will be conducted by Rev. Günter Dahle (Kitchener). 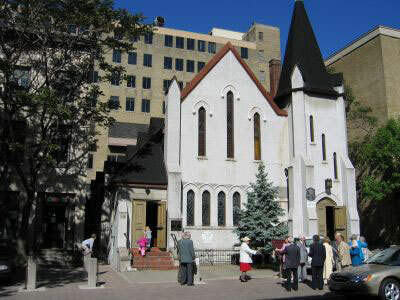 The historic, oldest Lutheran congregation in Toronto expects many incentives for growth from their new leader. For information about Echoworld Communications and its services send mail to info@echoworld.com .